Principia has carried out more than 50 projects in relation with wind turbines, all over the world, many of which caused by observed anomalies in the operation of wind turbines. The connection of the tower with its concrete footing is a frequent source of problems, which Principia has often analysed for different designs, also proposing remediation measures when appropriate. We have also analysed failures experienced by towers in operation in order to determine the causes and to suggest ways to avoid similar accidents in the future. The mechanical components and even the frame supporting all the equipment also generate problems, particularly because of fatigue phenomena, which Principia has analysed and for which solutions have been devised. Among the curious accidents studies it is perhaps worth highlighting the case of wind turbines that seemed to be especially prone to develop fires. Also in this case Principia clarified the origin and proposed measures to prevent them in the future. Principia investigated the causes of the structural failure experienced at a glass furnace. The investigation covered the analysis of the structural behaviour of the furnace in its actual conditions, as well as analyses for other hypothetical situations (“what if” conditions). The calculations are complex because of the extreme conditions, particularly regarding temperature, in which these furnaces operate. As is usual in forensic engineering projects, the work was not limited to performing calculations and drafting explanatory reports but included giving expert testimony in court. 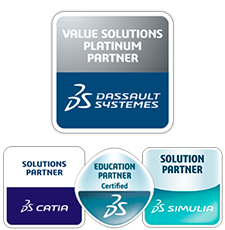 Post-failure investigations are usually much more complex than design calculations. The latter can afford to be fairly simplistic, provided their inaccuracies remain on the conservative side. The interpretation of real accidents, however, must incorporate the precise mechanisms and behaviour of the materials; for that role, parameter values cannot be conservative, they are simply erroneous. 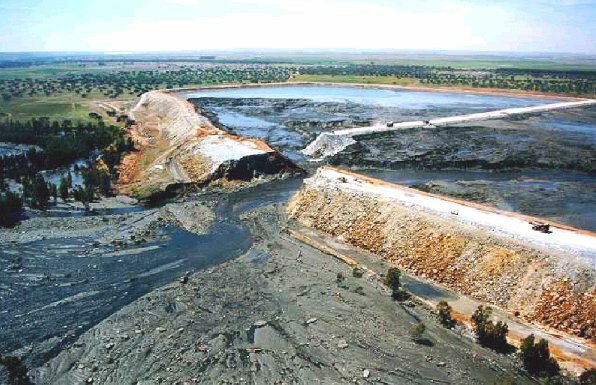 Principia studied for the owner the failure of the Aznalcóllar tailings pond and established that the failure occurred because the design had not accounted for the slow consolidation of the underlying blue clays anf for the brittleness of their behaviour. 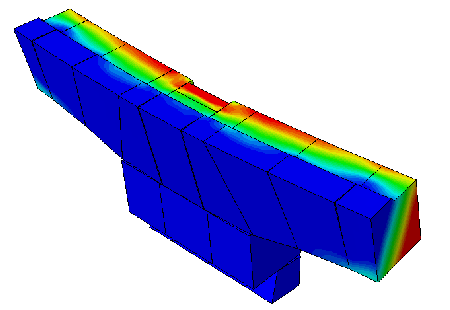 To be able to interpret the accident, the numerical simulation must face many complex challenges: gradual construction over 20 years, the coupled character of structural and hydraulic phenomena, the marked brittleness of the clay behaviour, the strong accelerations undergone by the dam upon liquefaction of the tailings, etc. The figures show an aerial photograph taken after the accident, together with an image generated for an animated explanation of the failure. 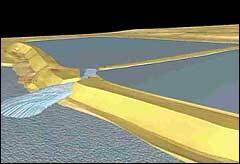 In a fraction of a minute, the dam moved tens of metres along hundreds of metres of its length. A lorry, travelling on the N-VI motorway with the tip body raised, impacted a large signal portal frame. The impact caused the frame to overturn, producing several fatalities and blocking all traffic in this major artery near Madrid for several hours. This accident is one of a number of them analysed by Principia, in this case collaborating with Esteyco. Principia carried out the in-situ observations of the various elements, the effects caused by the accident and the marks left by it. This information allowed conducting realistic simulations of the events in the computer, as well as reproducing the failure process in a reliable manner. The first figure comes from an animated visualisation of the accident sequence, developped to explain its evolution and characteristics. 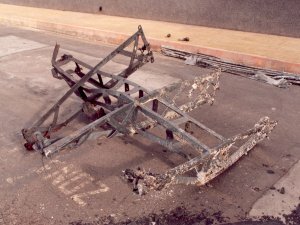 The photograph shows the underside of the lattice, with the marks left by the impact of the lorry. Fire and collapse, cause or effect? Having experienced a fire, as well as the collapse of an electricity pylon supporting two intermediate-voltage lines, the question posed was to determine the sequence of events. A preexisting fire could have caused the collapse of the pylon. Alternatively, arcs formed by the cables of the fallen pylon could have started the fire. Principia analysed the existing information and investigated the various possibilities using numerical simulations of the relevant phenomena. As a result, it was possible to establish that the fire had preceded the collapse of the pylon and that the failure mechanism of the latter had been embrittlement by contact with liquid metal. 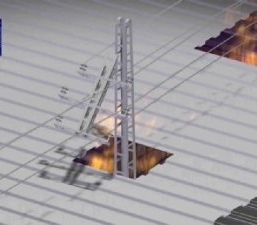 The figures show the collapsed pylon and a virtual image from an animated sequence developped for explaining the events: the pylon emerges through a roof and its upper part is in the process of falling down.